An unaffiliated website even had to apologize because Candace Owens' supporters were mistakenly donating to it. 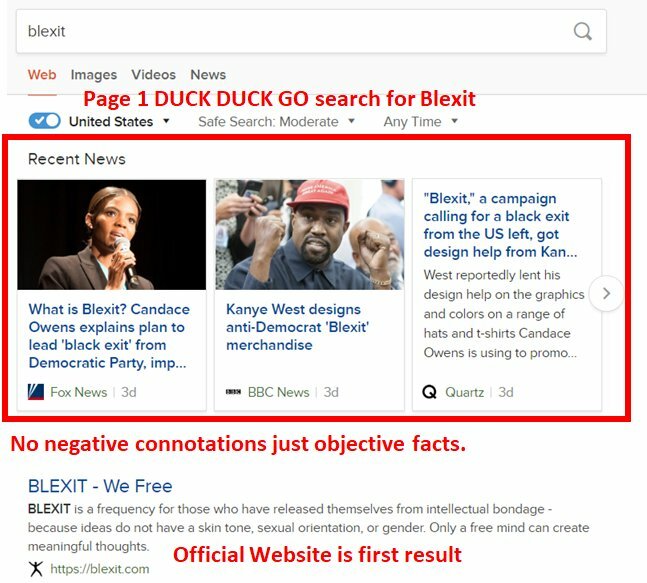 Here are the screenshots showing how Google buried the official Blexit website despite other search engines ranking it number 1. "I estimate conservatively that they could shift upwards of 12 million votes,” he warned. We are told to fear Russian bots and Kremlin agents who spend a pathetic amount on Facebook ads, yet Google having the power to sway millions of votes on election day by simple algorithm manipulation is no big deal? An American visitor who stayed at a hotel in Toronto where hundreds of “refugees” are being housed claims that animal services had to be called because migrants were slaughtering goats in the public bathrooms. Dozens of other complaints about sexual harassment, rudeness & threats from migrants. "My female colleagues were followed to their room by a group of men saying vulgar and sexual things." "My daughter kept getting harassed by full grown men." This is election meddling. This is insidious. The ban was instituted after both a left-wing Soros-funded group and the Washington Post drew attention to Infowars using PayPal as a payment processor. No specific examples whatsoever were officially provided to back up this claim. A Pakistani cricket player also placed a bounty of 20,000 euros on Wilders’ head, labelling him a “blasphemer”. @mshalk @danielledsouzag @DonaldJTrumpJr @realDonaldTrump 1/ I have to wonder if you even read the article you are critiquing (beyond perhaps the title). I strongly suspect you haven't because your criticisms do not even apply. The main thrust of her article is to decry the very binary thinking you are speaking of! #WalkAway movement as well as Candace Owens' similarly successful #Blexit movement. All three of those attempt to break free of the shackles of binary thinking that exists on the left. Our govt won't stop it now they say it can't be fixed. STOP buying products from companies who do business w/China. Many of you have thought this too. Our NAT Sec is at risk every time American companies do business w/nations who want to harm America. How much of America is now owned by our adversaries b/c of someone you or I voted into office? We wring our hands while our govt allows American land to be sold to some of the same people who kill our son's an daughters in war or plot terrorism here. Now we're dependent on Google, the same company who's willing to build communist China their own internet. How can we trust a company who is willing to do that who also possesses so much of America's information? Think about how much of our infrastructure is now tied to Google? Why is @RealAlexJones "Content" removed from Apple, Facebook, YouTube & Spotify platforms? Worse than #Shadowbanning is this "Targeted" Censorship of Conservatives with Millions of Followers that is sharing "The TRUTH They dont want You to know about"? Alex Jones is now being CENSORED, Are You NEXT? What conservative news outlet will be next?